GEO International students working together. It’s business as usual at Warren County’s International High School despite the news of President Trump’s travel ban. Trump issued an executive order last week temporarily banning travelers from seven majority-Muslim countries. Gateway to Educational Opportunities, or GEO, is an International school that is home to students from 25 different countries. More than half of those students are refugees. Principal Mike Stevenson said students have been surprisingly quiet about the travel ban and they arrived at school Monday and treated it like any other day. Stevens is conscious of the effect the ban could have on international students and their relatives, but says he hasn’t felt the need to address the student body. Stevens said he’s encouraged by the students' persistent belief in the American dream, and believes the way his students get along can be a model for adults. “With the diversity this school lives with day to day, from faith to money to gender to color to everything under the sun, it is amazing how well they do with each other,” Stevens said. GEO current events teacher Terry Nash has fielded some questions about green cards and how relatives of students might be affected by the travel ban. “It’s kind of scary to know that there’s a lot of hostility right now towards refugees and immigrants, at least in our political sector, but my job is not to make policy, but to love these kids and put them first,” Nash said. Nash said it’s tough to answer some of the questions the students have because there is a lot that is still unknown. He said he believes in being honest with them, and helping them find the information that is available. GEO works in partnership with Warren Central High School and is Kentucky’s first international high school. 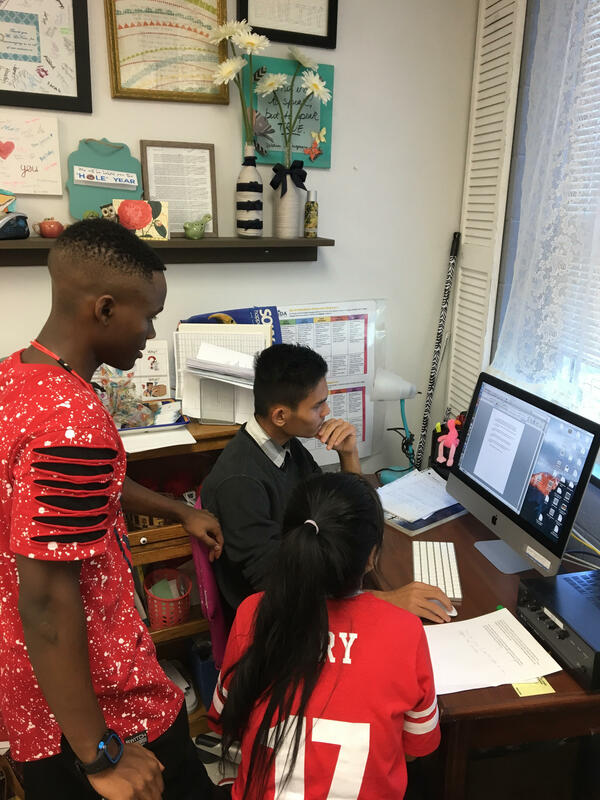 Students at Kentucky’s first international high school are preparing to finish their first semester. Gateway to Educational Opportunities International is located on Warren Central High School’s campus in Bowling Green. About 65 percent of the school’s 180 students are refugees. Assistant Principal Adam Hatcher said some students know four or five languages, with most able to speak at least rudimentary English. Some also complain that McConnell is not listening to their concerns. McConnell told ABC last weekend that he doesn’t want to make a blanket criticism of the policy, but the government should be careful going forward. I went to the “No Ban! No Wall!” rally site outside the federal courthouse to talk to participants and some passers-by. Sen. Mitch McConnell’s press office declined to respond to an inquiry, pointing instead to his appearance on ABC’s This Week. Western Kentucky University has identified 22 students and two faculty members who are from the countries impacted by President Trump’s executive order banning entry into the U.S. The school issued a statement Monday saying it doesn’t know of any affected students or faculty members who are currently overseas or being prevented from re-entering the U.S.
Trump’s order barred travelers from seven majority-Muslim nations from entering the U.S. for 90 days. WKU says its advising students and employees from those seven countries to avoid leaving the U.S. while parts of the ban are still in place. Kentuckians awaiting to reunite with loved ones fleeing war torn countries are among those affected by the immigration bans enacted by President Donald Trump over the weekend. The state’s refugee community is nervous about the future. Lodrige Mutabazi is a 32-year-old Congolese refugee and works at the Amazon shipping center in Lexington. He moved here a little over a year ago. Hear Ryland's feature about a Congolese refugee living in Kentucky. A key Senate committee today voted to approve the nomination of Betsy DeVos, a school choice activist and billionaire Republican donor, to be Secretary of Education, despite fierce objections of Senate Democrats, teachers' unions and others. There's much speculation as to exactly how she might carry out President Trump's stated priority of increasing school choice. A significant clue comes from the American Federation for Children, the advocacy organization DeVos chaired until she was nominated. AFC supports both publicly funded charter schools and even more so, "private school choice" — publicly sponsored programs that give families money to spend on tuition at private schools. Kentucky is one of seven states in the U.S. that doesn’t allow charter schools. But the General Assembly is likely to soon approve a bill that would make the organizations a reality in the Bluegrass. Lawmakers will return next week to consider the measure. So what exactly are charter schools, and are they effective? Supporters have pushed to open Kentucky up to charter schools for years, but opponents, most notably the state teacher’s union, successfully lobbied to keep the policy from passing enabling legislation into law. During a legislative hearing last year, Education and Workforce Development Secretary Hal Heiner gave an impassioned speech in favor of charters, calling out the Kentucky Educators Association for opposing them. Hear Ryland's story about how the creation of charter schools could impact Kentucky.